Robert was born in 1274, probably at Turnberry Castle, the eldest son of Robert Bruce, Earl of Carrick and Marjorie, Countess of Carrick. 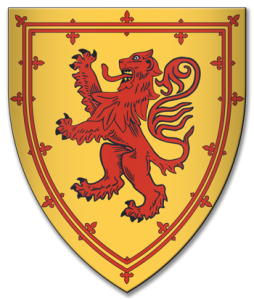 His grandfather was Robert Bruce, Lord of Annandale, known as ‘the Competitor’, since he was, along with John Balliol, one of the two principal claimants to the Scottish throne in 1291-2. Following the abdication of King John Balliol in 1296, Robert initially accepted Edward I’s overlordship of Scotland, but in 1297, along with Bishop Wishart of Glasgow and James 5th High Steward of Scotland, he supported the rising against Edward led by William Wallace. After the failure of the rising, he again submitted to Edward I, until around 1305, he took the unexpected and perilous decision to claim the throne of Scotland. In 1306 he murdered his rival John ‘the Red’ Comyn, Lord of Badenoch in Greyfriars’ Kirk, Dumfries, for which deed he was excommunicated. A few weeks later he was crowned King. Over the following few years, he endured much, including considerable personal hardship as a fugitive in his own land, the deaths of three of his brothers at the hands of the English and the imprisonment of his wife, daughter and two sisters in England. Gradually building support for his cause, he won a series of small scale battles against the occupying forces and recaptured many of the Scottish castles under English control. This culminated in a Scottish victory over a significantly larger English army in the major Battle of Bannockburn in 1314. There was still much to be done to secure peace for the Kingdom of Scotland. Numerous raids into northern England persuaded the English of the need for a peaceful settlement. The Declaration of Arbroath of 1320 clearly proclaimed the independent status of Scotland and eventually in 1328, in the Treaty of Edinburgh, King Edward III of England fully recognised Scotland as a sovereign nation and renounced any English claims to overlordship. King Robert died of leprosy the following year, at his residence at Cardross. A great knight, military strategist and statesman, Robert was also respected as a merciful King, which contributed much to uniting the nation under his rule. He was married twice, firstly to Isabel of Mar, by whom he had one daughter, Marjorie. From her descended the Stewart monarchs. His second wife, Elizabeth de Burgh, was the mother of King David II, who succeeded Robert on the throne.